Exuding modern glamour, the Houston Bar Stool Grey will add a touch of class to your interior. Gorgeous in grey, the subtle colour scheme gives way to an eye-catching and comfortable design, ensuring the Houston Bar Stool is a focal point wherever it is placed. Upholstered with cool grey faux leather, the seat exhibits panelled stitch detailing for a distinctive feature that gives an eye-catching aesthetic. 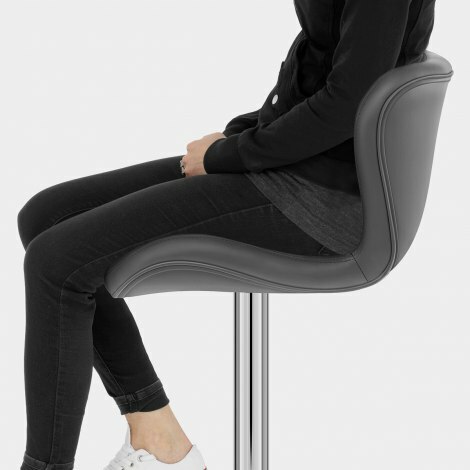 Displaying an encompassing flared design, the tall backrest lends a relaxed feel and dense padding throughout the seat ensures quality comfort. Sleek and slender, the chromed framework incorporates a variable height gas lift mechanism and a 360-degree swivel feature for easy accessibility. A round base with a protective guard roots the design, whilst the curved footrest mirrors the shape of the seat and provides extra support. "Love these, so comfortable, worth every penny"
Excellent product and delivery service. Very easy to assemble. Ordered 3 bar stools and am so pleased with them. Having spent ages looking for the right bar stools most at silly prices, I came across your website and am so glad I did. The choice is amazing and to say we found exactly what we were looking for at such a fantastic price is great. Purchased 2 of these bar stools after reading previous reviews. Everything said was true, easy to assemble, good looking, we are very pleased with them. Sturdy, well made, good colour representation on screen - good price and fantastic delivery. Ordered Sunday, arrived Monday!! Thank you. 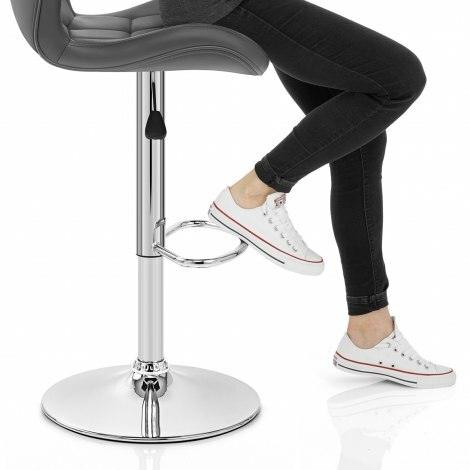 These stools are excellent; stylish, comfortable and look great. The faux leather could be mistaken for real. My husband was impressed by how easy they are to assemble - the charming lady in the video helped his concentration! Would recommend these stools - great value for the money.